This is a branch from topic "how to start writing in the end of an existing file? (SD Card)". IIRC gcc has an option that will tell it to print all defined macros. Just for the record it is "-E -dM", but as Lee says, not relevant here. 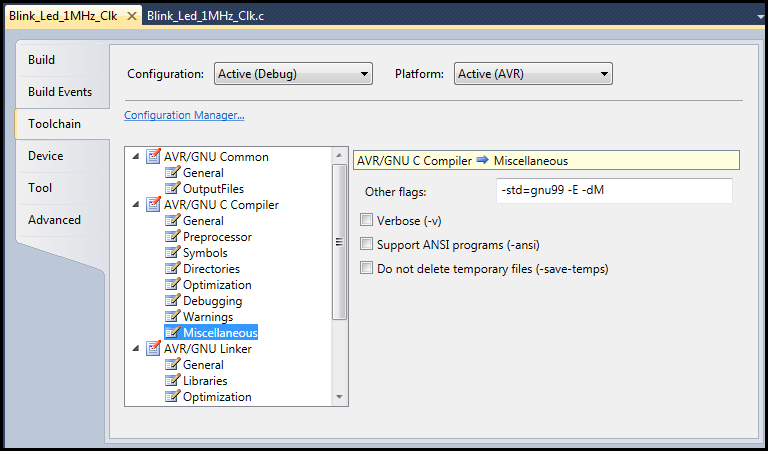 I tried this option in a short program using Atmel Studio 6.2 and got an error (gcc output shown below). "C:\Program Files (x86)\Atmel\Atmel Toolchain\AVR8 GCC\Native\3.4.1061\avr8-gnu-toolchain\bin\avr-gcc.exe" -x c -funsigned-char -funsigned-bitfields -DDEBUG -O1 -ffunction-sections -fdata-sections -fpack-struct -fshort-enums -g2 -Wall -mmcu=atmega328p -c -std=gnu99 -E -dM -MD -MP -MF "Blink_Led_1MHz_Clk.d" -MT"Blink_Led_1MHz_Clk.d" -MT"Blink_Led_1MHz_Clk.o" -o "Blink_Led_1MHz_Clk.o" ".././Blink_Led_1MHz_Clk.c"
The command exited with code 2. Done building target "CoreBuild" in project "Blink_Led_1MHz_Clk.cproj" -- FAILED. Done building project "Blink_Led_1MHz_Clk.cproj" -- FAILED. Edit: When I build without the "-E -dM" option, there are no build errors and the firmware runs correctly. So the rest of the build is bound to fail, because it's not generating an object file - on which the rest of the build depends! Note: when googling, you have to enclose these things in quotes - otherwise google interprets the '-' to mean "ignore"
awneil is right: you're build is doomed to failed with -E, try it from the command line instead. you're build is doomed to failed with -E, try it from the command line instead. awneil and netizen, thanks for your replies. I understand now that with the -E, no .o file is generated causing the fail. netizen, thanks for showing me how to do it from a command line. But why didn't the -dM cause the list of defined macros to appear in the studio output screen? The -c says "just compile this" , the -o says "write the output into...". After this file.o then contains unlinked ELF/DWARF binary. The lack of -c means compile AND link. Usually this form is used with just .o files as input but it can be used with .c to go straight to linked output. The output file.elf then contains linked ELF/DWARF. In this the -E says stop at the end of preprocessing and -dM says dump the macros. But the -o is the problem. Yes the "output" is going to be a load of text showing all the dumped macros but the -o says "and write it to file.o". So your command worked but you were looking in the wrong place for the result. While nothing on earth would ever make you normally open a file.o in a text editor (usually it contains ELF/DWARF binary) that is exactly where you should have looked for the text output on this occasion. In general all forms of -E don't make a lot of sense when using an IDE unless you plan to open .o files as text. Where you don't even need a C file, the lone '-' means "input from stdin" and then "< /dev/null" feeds "nothing" in as source. clawson, thanks for the explanation. I now know why the Build failed and why no list of defined macros was displayed. The "-E -dm" is not something that I would use very often - once every couple years maybe - but it's nice to know that it is there and how to use it. Edit: If invoked from the command line, would a symbol defined in the project properties (such as F_CPU) show up in the list? I'm guessing not. And the output would include F_CPU. But this all seems a bit futile, why bother to type it as a -D in the input just to have it come out again in the output? You already know what it's defined as because you just typed the -D that defined it! If you really want to see the project defines from the IDE I guess you go with option 1 then look to file.o for the result. EDIT: couldn't stand it any longer so dug out laptop to edit/fix formatting above. I was just pointing out that when using the command line option, the list of defined macros may not be complete. I re-ran the test shown in post #1 and no .o file was produced. Atmel Studio 6.2 Solution Explorer shows no output file, but when I use Windows Explorer to look in the Debug directory the .o file is there and does contain the list of defined macros.